A photo of a veteran car received from Nicholas Woollett (UK) who took the image from a large picture behind the counter in St Michael's charity shop in Bexhill. 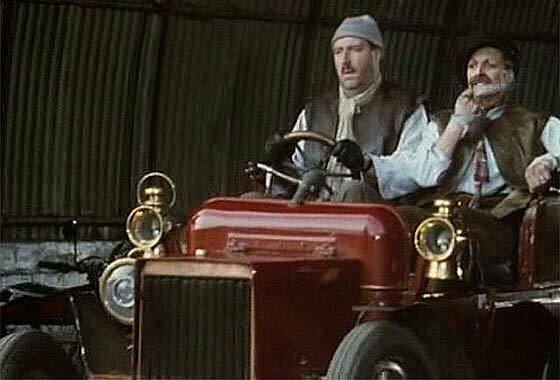 Can we identify this vehicle, maybe a Darracq? -- Not a Darracq but it is French and also made near Paris. Very noticeable pointer to the manufacturer is the offset crank. To define the model, there is no discernable lip to the bonnet above the matrix, and tierod is forward of axle. 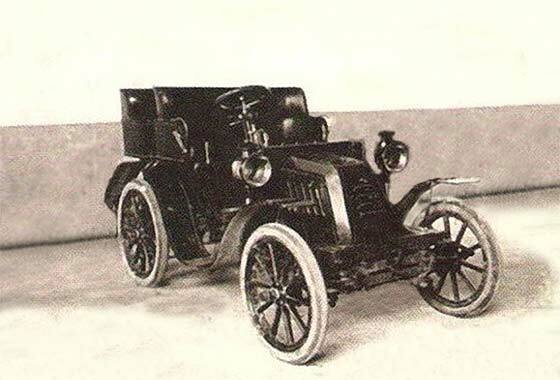 This is a cca 1902 Panhard & Levassor 16hp Tonneau. Another request for identification of a vehicles received from our regular contributor Joao Ferreira (Portugal). This seems a scan of photo of first car in Vila Real, a town in the north of Portugal best known for earliest Portuguese motor racing. -- Photo is too poor quality to make out any detail. We need photos at BEST RESOLUTION possible. However, our John Warburton and an owner colleague advised this is a cca1902 Gladiator Rear Entrance Tonneau,6.5HP single cylinder engine. 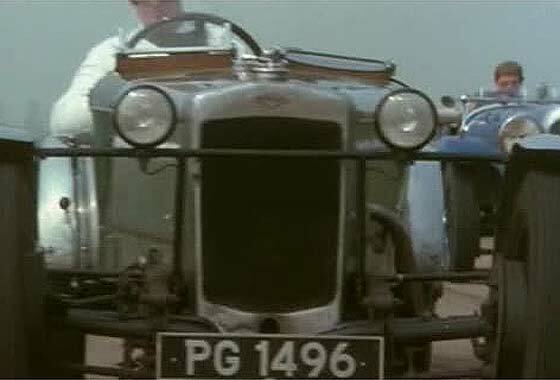 Cinema screen grab of a vehicle which appeared in the British TV comedy series 'Allo 'Allo which ran from 1982 to 1992, where the vehicles are being investigated by IMCDB. The series is about a Cafe in France during the Second World War. -- As this series is set in France and as Rene is driving the car, one would think it ought to be French. Actually it is not. It is a British cca 1904 Rover 8HP Two-Seater. It differs fundamentally from the later 6hp by having no front dumbirons. A photo of a couple of cars received from Nigel Williams (UK) who advises he is doing ancestry research and has a mystery photograph of his grandfather standing by a MORS car, and with another car parked next door. Can we tell the make, model and when made. -- I thought perhaps Mercedes but our Star expert John Warburton advises the white car on left is a cca 1906 Star Surrey, probably the 14hp. Body type used for collecting guests from station or taking to grouse moors. 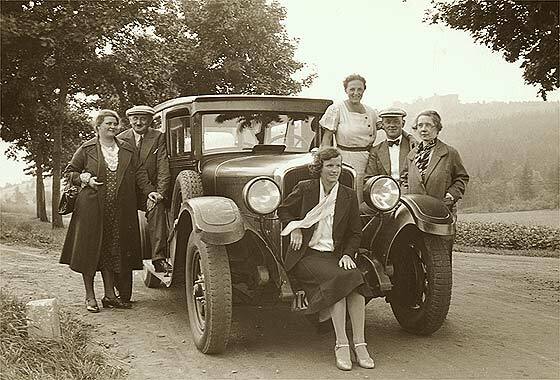 A photo of a couple of cars received from Nigel Williams (UK) who advises he is doing ancestry research and has a mystery photograph of his grandfather standing by a MORS car. Can we tell the model and when made, and from the registration whether the photo is in London or Austria! -- Numberplate is London CC early 06. The Mors badge is pre big lettered Mors logo. This is a cca 1905/6 Mors 24-32h Surrey. Body type used for collecting guests from station or taking to grouse moors. Another request for identification of vehicles received from our regular contributor Joao Ferreira (Portugal). This one was a link to a film. He says "this is documenting one of the first automobile races in Portugal, in Hippodrome D. Amélia. I am investigating the race itself, where and when it happened ? Can you help with the make of cars? --Our contact Craig Gillingham in Australia suggests this is a cca 1908 Isotta Fraschini Type FE, - who gained much fame through racing including Coppa Florio. 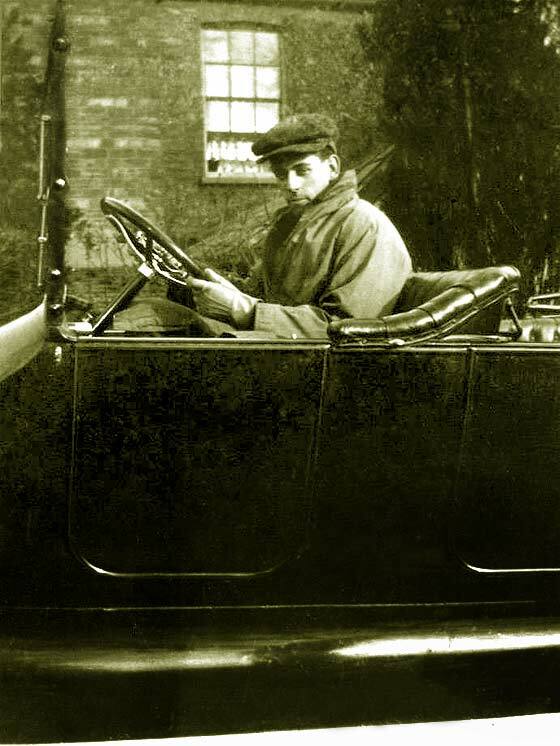 A couple of photos received from Anne Bunyan (UK) who advises that her grandfather was Chauffeur to the Earl of Buckinghamshire, England around 1906 - 1911. Have we any idea what the car is he is driving. -- The registration of the car was Buckinghamshire CC issue of 1903, which is obviously not the date of the car, so is a retained 'cherished number' kept by the owner. 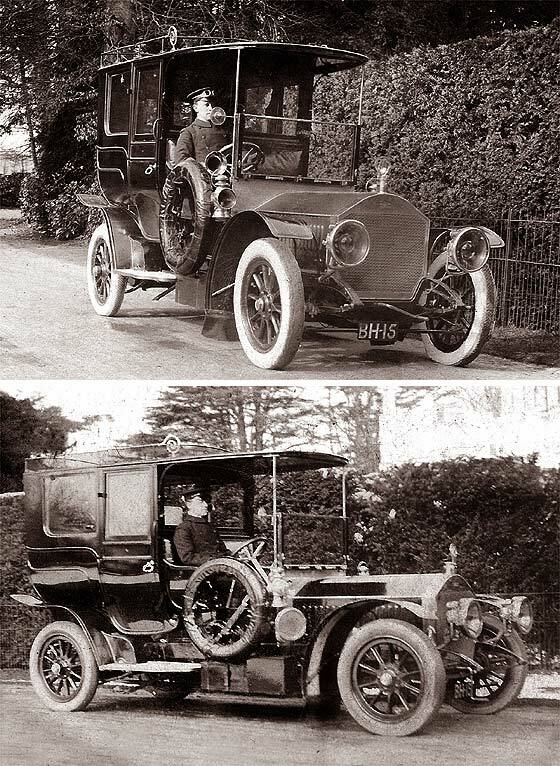 The car is a cca 1908 Napier Limousine, probably the 40HP six, made in Acton London. Became major aircraft engine maker. Another request for identification of vehicles received from our regular contributor Joao Ferreira (Portugal). This one was a link to a film. 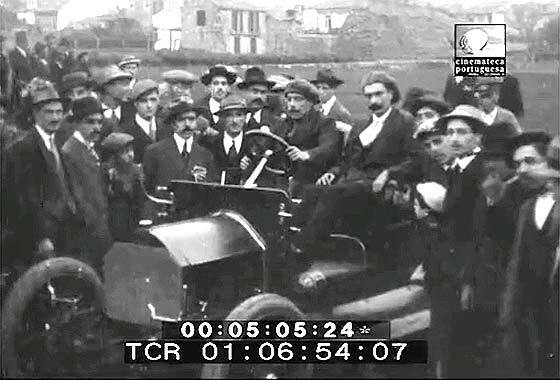 He says "this is documenting one of the first automobile races in Portugal, in Hippodrome D. Amélia. I am investigating the race itself, where and when it happened ? Can you help with the make of cars? -- This screen-grab shows (left) a cca 1909 Georges Roy 12 HP Touring Sport Torpedo (French) and a cca 1904 Mercedes Sport Touring 40'45 HP (German). 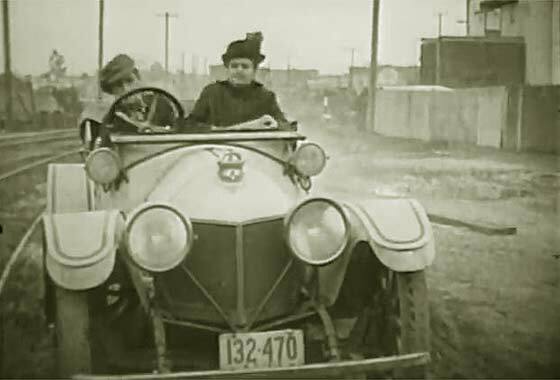 Cinema screen grab of a vehicle which appeared in a 1914 American silent film comedy "Mickey" where the vehicles are being investigated by IMCDB. The film is about a young woman Mickey bought up in a mining environment going to New York. -- Bit of research advised this was the biggest grossing film of 1918 at $8M. This is an American car made in Detroit, Michigan and the only model with the distinctive Vee radiator. This is a cca 1913 Abbott-Detroit 45-50 Battleship Roadster. Another request for identification of vehicles received from our regular contributor Joao Ferreira (Portugal). This one was a link to a film. He says "this is documenting one of the first automobile races in Portugal, in Hippodrome D. Amélia. I am investigating the race itself, where and when it happened ? Can you help with the make of cars? -- This screen-grab shows a cca 1913 Adler 7'17 Doppelphaeton (German) and a cca 1913 Gregoire 13'18 Voiture de Sport (French). Not sure of white car! Another request for identification of a vehicles received from our regular contributor Joao Ferreira (Portugal). 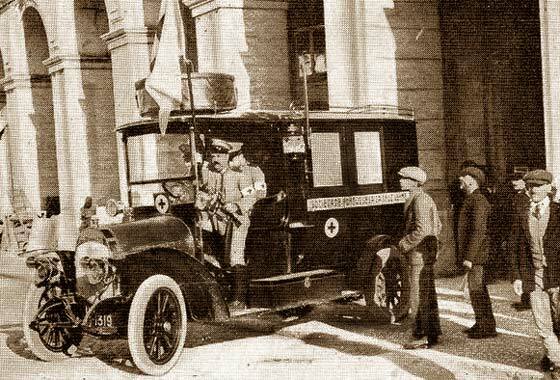 Photo is of a Red Cross ambulance taken in "Terreiro do Paço", the center Lisbon in 1916. Portugal had just entered the War and perhaps it was destined for the war front. It seems an adapted vehicle. -- We have looked at many makes and many nationalities, and had no immediate answer. It was our contributor Ariejan Bos who advised that this is a cca 1914 Lloyd. 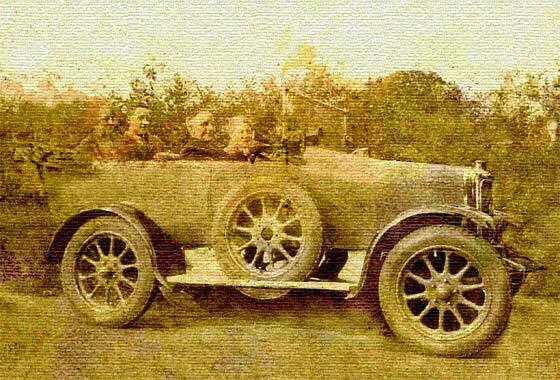 A photo of an unusual car received from Rasmus Dahl-Sorensen, Roskilde (Denmark) taken on June 14, 1921 in Nykoebing Sjaelland in Denmark. Photo is of Great Grandfather Carl Christian Larsen, wife Ingrid Louise and two of their children, rear left being Niels Lund. 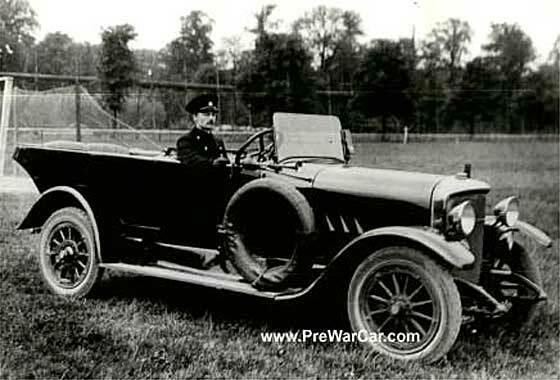 -- Despite photo being dated 1921, the car has the pre-war bodywork and still has gas lighting, so is very likely pre-war. Interestingly the car is British made in Birmingham, being a cca 1914 Calthorpe 10'4 HP Tourer. Photo received from Patrick Kay of WagScreen Films (UK) who are making a historical film about Thimbleby War Memorial and the people connected, including the WW1 soldier in the photo. Could we help with the make of the car. -- Not very helpful photo but car is American. We thought Buick as windscreen is very tall. No door handles/hinges. Hand rail behind seat. Tall doors with skirt below. 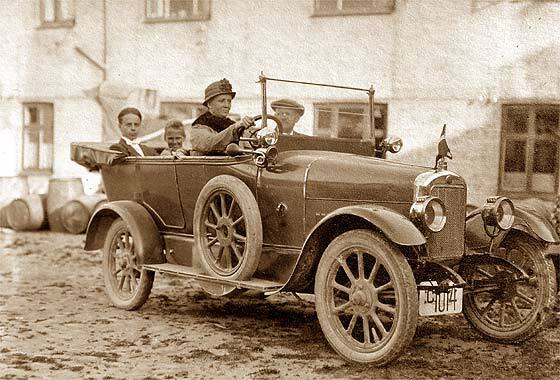 Our external contributor Ariejan Bos advised that this is a ca 1915 Studebaker Series 15 Touring. 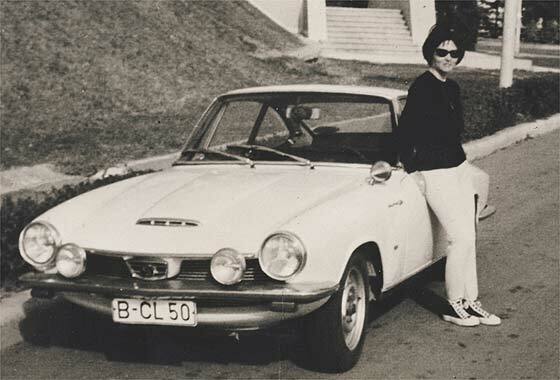 Another lovely photo submitted to the AACA and posted by Leif Holmberg (Sweden) asking for ID. Photo features a tourist bus run by Herm. Moller of Kobenhavn. -- Kobenhavn is Copenhagen in Denmark. Roundish shape of rad and small inspection plate are typical of a cca WW1 Scandia-Vabis. Chain drive and solid tyres are pre-war/just post-war features. 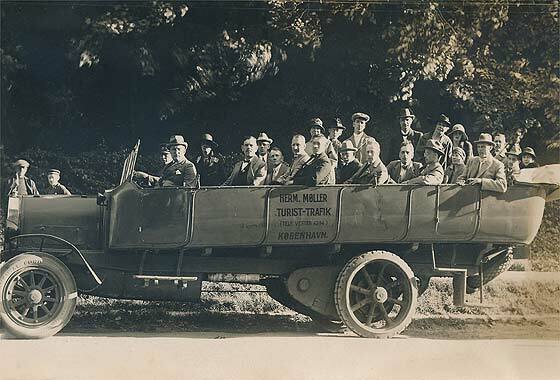 This is probably an updated truck with a charabanc body and pneumatics on front. 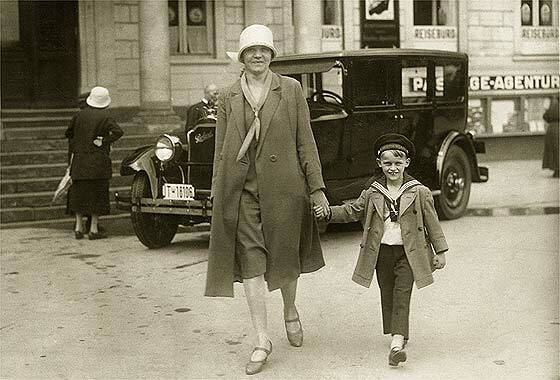 The photo and fashions are much later 1920s. A tiny photo received from Paul Warren, Derbyshire (UK) who got us from the Society of Genealogists. Maternal great grandfather Frederick Smith is driving, butcher in Potton, Beds. Wife Sarah accompanies him in the front and his eldest daughter, Lilian is in the back. Sarah died March 1951. but the photo pre dates this by a while. Austin? -- Difficult to say exactly when the photo was taken due to poor quality, but the car with bulk mounted headlights is a cca 1923 Jowttl Long Four Tourer. Another photo received from our regular contributor Raoul Rainer from Stuttgart (Germany) from a batch of photos he purchased recently and has on line. Do we have any idea what it is? A tourer from the 1920s probably German although it's RHD. -- Unhelpful photo. 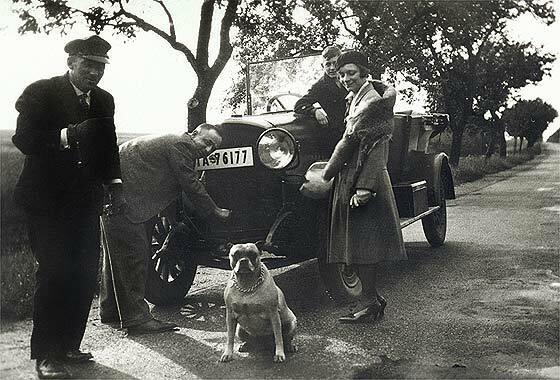 RHD draws us to it being possibly Slovak Nesselsdorfer S/T/U (Tatra) as Czechoslovakia was RHD, but more likely it is a German cca 1925 Horch Tulip-bodied Phaeton. Horch registered 'Audi' name in 1910. Similar to car on HP23..
Photo received from Sue Stevens (UK) who was hoping that we may be able to identify the car in the attached photograph. 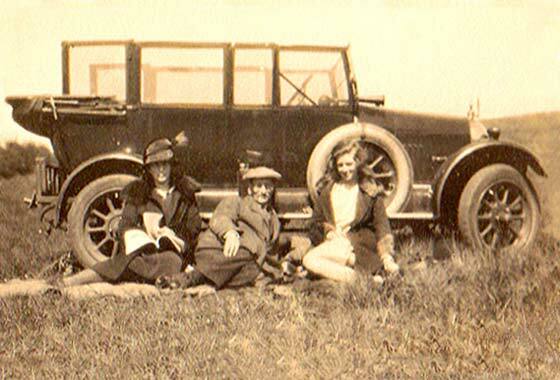 She thinks the photo is post-1929 but would love to know what car this family drove in order to enjoy their picnic! -- Not a very clear photo, small and blurry, but relatively easy to identify that it is a Bullnose Morris; not so easy on the model and year. Small rad and petrol can on the running board helped Chas Moody to identify it as cca 1926 Morris 11.9 Cowley Tourer. Another photo received from our regular contributor Raoul Rainer from Stuttgart (Germany) from a batch of photos he purchased recently and has on line. Do we have any idea what it is? Possibly an American car because of the wide track, but the hood ornament is concealed. -- Many features are European; semaphore indicators and curved headlamps supports with thin linking bar. 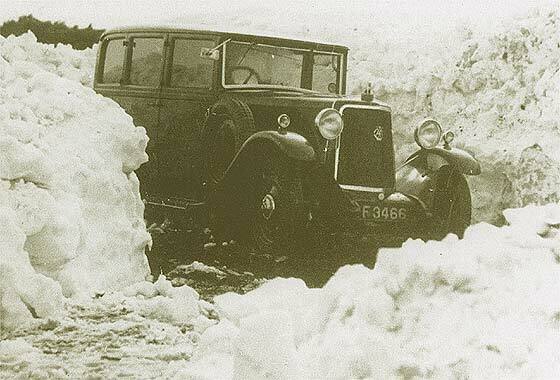 Hump on the bonnet behind the radiator cap is an indicator of a cca 1928 Brennabor Limousine, possibly the ASL. Another photo received from our regular contributor Raoul Rainer from Stuttgart (Germany) from a batch of photos he purchased recently and has on line. Do we have any idea what it is? "Packard" style radiator with a sign reading "Rekord". Could be a big Opel, definitely not a Hanomag. -- 'Packard' style rad, mainly because it is a Packard ! Seven letter logo when enlarged is definitely Packard and this style of logo & car details seems to match a cca 1928 Packard 526 Four Door Sedan. 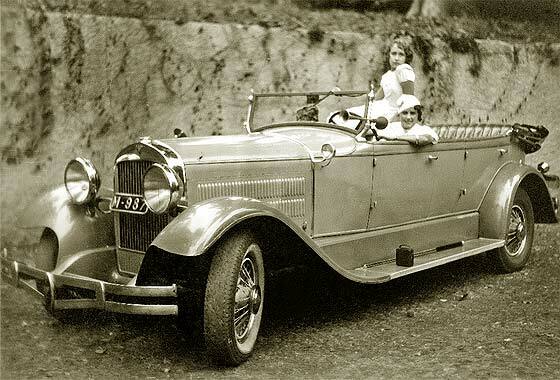 A photo of an interesting car received from Eugenio Santos (Portugal) asking if we can advise where the car is now; Hudson Sport Phaeton taken on the Island of Madeira, Portugal, in 1935. -- The enquiry is too specialised for us. Our knowledge base relates mainly to identification of veteran and vintage vehicles, but regretfully not in detail relative to a specific car. He needs to contact the car club which caters for that make, and/or general car club in the country where it was last known. A photo of an interesting car received from Eugenio Santos (Portugal) asking for identification. Registration plate M-1160 (later MD-15-79) was from the year 1930. Photo was taken in Funchal, capital of Madeira island, Portugal. -- The car is unusual in as much as it is British made. Madeira was a British Crown Colony in the 1800s, and the British have rather liked the fortified Madeira wine. The car is a cca 1920 Triumph Super Seven Tourer with very unusual filled wings and spring surrounds. A scan from a book received from Brian Reid, Melbourne (Australia) of a car owned by his great uncle. Registration seems Essex UK. Strange rad cap. -- Reg is incomplete as is either 1907 and a "cherished plate", or fist letter is hidden. Either is not much help. 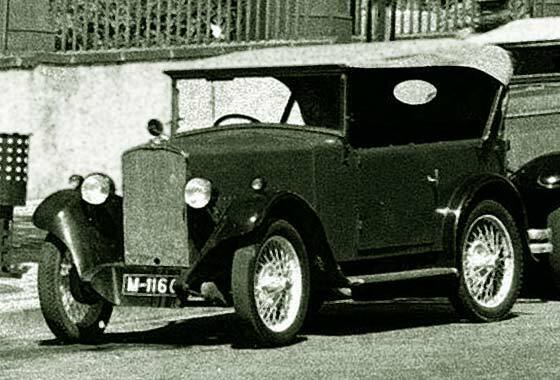 The car is a cca 1931 Armstrong Siddeley coach-built saloon, body certainly by Burlington and engine probably 15HP, all as confirmed by our A-S specialist Simon Pearce. The rad cap is an impressive largish Sphinx, the A-S Mascot. Cinema screen grab of a vehicle which appeared in a 1985 British film drama "Dance with a Starnger" where the vehicles are being investigated by IMCDB. The film is about a the last woman to be hanged for murder in Britain in the 1950s. -- Quite a specialised car built by a company started by Capitain Archibald Frazer-Nash in 1922 who made high performance sports-racing cars incorporating unique multi-chain transmission. Became UK importers of BMW 1934 and Porsche 1956. Not a request for identification because we know what it is, but as it is so very unusual it may help others when searching. -- Spotted at a Riley Register run to Riverhill House in Kent. This is a London CC August 1938 registered Autovia V8 Mulliner Limousine. Made by separate company of which Victor Riley was a director, lasting 1936-38, and going into the receivership with the rest of Riley. Designed to compete with Rolls Royce, only about 35 were made; light sports and limousine. Another lovely photograph from our regular contributor Cicos Florin in Constanta (Romania). This one is from elsewhere but what is it? -- Not that easy. German made in Dingolfing by an 1883 agricultural implements manufacturer, who went on to make a scooter called the Gogo in 1951. They turned to cars by building 280,000 Gogomobil minicars. This is their lovely Frua cca1966 Glas 1700 GT Coupe. Company bought by BMW, who continued to badge the cars with BMW engines.